Today's post makes me extra happy. There is nothing sweeter than planning your baby's nursery. And I have put 10 of my must have pieces when it comes to my idea of perfect nursery for our baby girl. 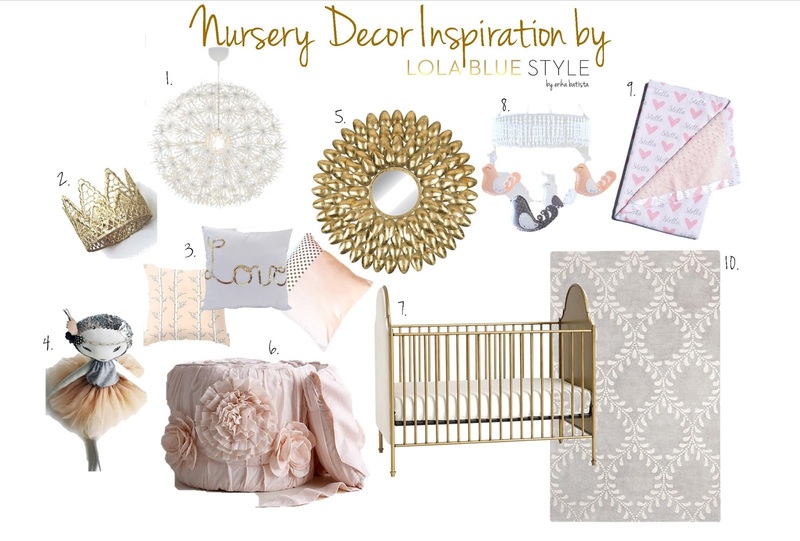 I created the nursery decor inspiration board above to give you an idea of how pretty all the pieces will look together. I am obsessed with this peachy-pink color and hints of gold and gray. I just love the simplicity and elegance as well as the girly and sweet vibe. When putting this nursery style idea together I knew I wanted to have lots of textures and a couple of great focus pieces. Remember you can create this nursery with any budget, you don't have to get exactly what you see here, maybe you have a bigger or smaller budget and that's all ok. Work with what you have and be creative. Give your baby a calm and comfortable space to call her little nook. Below I am breaking down each piece and why I love it, as well as a link to where you can purchase it, if you wish. I can't wait to put together our daughter's nursery space, I think it will be a lot of fun just like it was for my son. Don't forget to have fun with it. For one thing I did learn is that you don't need the entire crib bedding set, unless you really want it. Crib sets can be quite expensive. For this baby (our second) I plan on getting just the bumper and skirt. I never used the quilt and valances with my sons, so that was pretty much a waste of money for us. I plan on getting a bumper similar or the same as the one you see here and a simple peachy crib skirt, crib sheets are easy to find and you will be doing a lot of laundry so why not spend a little less and get a few crib sheets that simply match your decor. Now on to the fun stuff, because I am sure you are thinking "Erika, enough chatting, just tell me where I can get this!" - I love love love this, it is a great and chic alternative to the typical and traditional chandelier. - I am obsessed with all things gold + glitter and this crown is the perfect accessory idea for your nursery as a sweet and fun accent on her dresser as well as a great prop for newborn photos. Win-win! - There's nothing that makes a crib more cozy than a few adorable pillows, these colors are perfect for what I am looking for and look great together even though they are all from different shops. - I have been dreaming of this doll for weeks. It is the prettiest handmade doll I have ever seen and my daughter told me she needs it. Now that is a steep price but if you ave the budget I say why not. It makes for a great keepsake for years to come as well as a stunning decoration piece. - When it comes to a great focus piece a great lighting fixture or big wall decor piece is a great way to achieve your main style. I fell in love with this gold mirror, I think it is beautiful for a little girl's nursery. Of course be sure to have it hung up properly and securely. As it can be a heavy piece. - One of my must haves is a great crib bumper. For my son we bought a beautiful Jenna Glean set and I have since loved a nice thick and soft crib bumper. This RH bumper is everything I wish for. I think the color and texture is perfect. The flower detail is perfection, I am in complete love with it. - While I will not be spending this much money for a crib, I think that if you have the budget this is a stunning crib to have. I love the classic feel and stunning gold details. There are many options to finding a great crib at a great price, for us we will be getting a white crib. An expensive crib is just not in my must-have list, so I will be skipping this gorgeous one but I hope one of you gets it! - When looking for the perfect mobile, I found this amazing crystals and felt bird mobile on Etsy. I think it is so pretty + delicate which I love. I think adding a little bit of color into a crisp and light nursery is a must and these adorable birds and pretty crystals are just stunning. - I saw this blanket on one of my favorite mommy insta friends (AriSays) feed. I love that these cute and cuddly blankets are not only personalized but they have a velvety soft side for your little one's cozy nights. - A great rug is a great way to add texture and the perfect final touch to any room. And for this nursery inspiration board I fell in love with this gray area rug. There are many options for this, if this price is out of your range, I recommend going to stores like Walmart, Target and Home Goods. Which is what I will be doing but this rug serves as great inspiration when trying to find what I am looking for. Remember you can always add all these items on to your baby registry, which is the best and easiest way to let your baby shower guests know exactly what you want and what need, believe me they will be happy that you already picked out your favorites, so don't be embarrassed when scanning those adorable items away. If you love all these pieces but can't afford them, I have great news ladies... Simply add Huggies Little Snugglers and Natural Care Wipes to your baby registry by clicking HERE and you can be entered for the chance to make your baby dream wish come true! And that dream might just be your nursery! I hope you moms-to-be enjoyed this baby nursery inspiration board, next week I will be sharing tips for first time moms and what I have learned in my 3+ years of motherhood. So stay tuned for that, have a sweet and productive week, let me know what other topics and ideas you would like to see!